Oh flip flip and flip again!!!!!! if your students arent asking questions tomorrow, you must be covering it very well at school. they must be wondering!!!! This is a new top, part of a set that i ordered from Next! I think I will send them back and get the next size up!! I can't see these fitting for long!! Oh wow Caroline thats impressive and is going to be a big baby. What did Gareth say when he saw your bump? 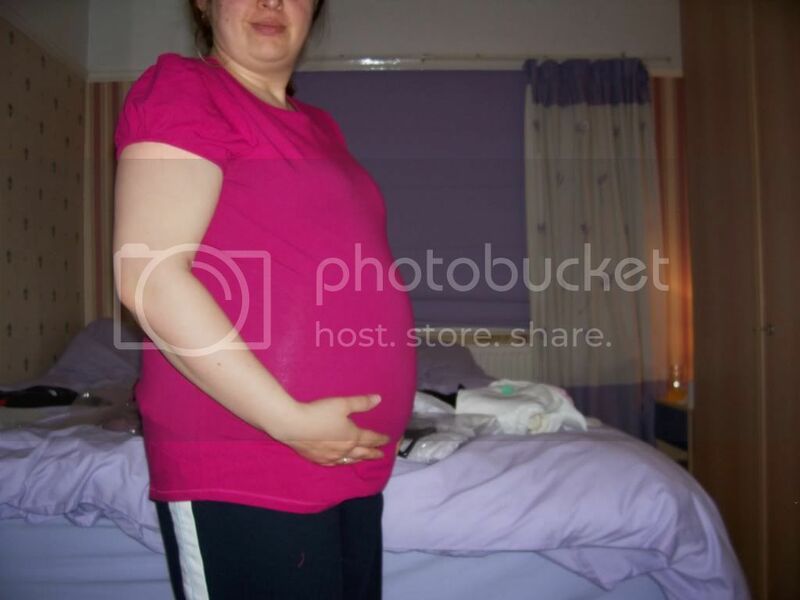 Wow caroline thats getting bigger by the week,good luck with the kids,no hiding it now. wow thats a great bump!!! yep what did Gareth think??? Gareth has been patting my bump and talking to it!! I am thinking that if the kids ask i might try and put them off the scent for a few weeks!!! The kids will be very excited, especially my form!!! I can just hear some of the snide comments that the staff will make!! 1 woman has never had kids (and quite frankly we should be thankful as the maternal gene well and truly bypassed her) and goes on about how she is owed 6 months off work paid as that is what we get!! What a fab bump, i'm jealous!! Thanks Sarah! I have a feeling the novelty may wear off when i get stuck in a supermarket isle like i did last time!!! I measured 5ft 3 inches round last time and thought i could squeeze between 2 island displays in a packed supermarket and just about got my bump wedged. I couldn't get behind the wheel of a car, and i have a zafira which has plenty of space! Everyone else has seen this before, this photo was taken 3 days before i gave birth. The footy shirt is XXL. Oh my goodness Caroline, you are defo getting bigger! Bronwyn was 11lb 12.5oz!!!!! Lighter than we thought!! At the time of her birth the constultant warned me to expect a bigger bay next time!! I was also carrying about a third more water than a usual pregnancy, according to the surgeons! Caroline, smurfy has got bigger since we met on monday!! I hope you manage to hide it from the school kids until you are ready to tell them, but not sure how long you'll be able to do it for. Wow Caroline, that's a great bump!!!! I don't think you'll be able to hide it from the kids at school for much longer!! Well, no kids were rude enough to ask if i was pregnant. But 2 staff asked, 1 asked when i was having another baby and nearly fell over when I said the 6th Dec. She said that she hadn't realised. Another asked when I was due as I was leaving school, I am not sure if someone has told her, but when I asked her to keep it quiet as very few people know she said that everyone would know soon as it was obvious!! Got my year 11's tomorrow, they will ask. A few people did actually look at my tummy whilst talking to me! No, because of her expected size and the fact that my waters had broken 24 hours previously and nothing had happened we went for a C section. Its a good job too, as if I had tried to give birth naturally I would have needed an emergency C section and would probably have lost her as her head was completely stuck and needed 7 midwives, surgeons, nurses to remove her from me!! Sally I would love a cute small bump, but i think I am destined to have a bump the size of a small African country again!! !